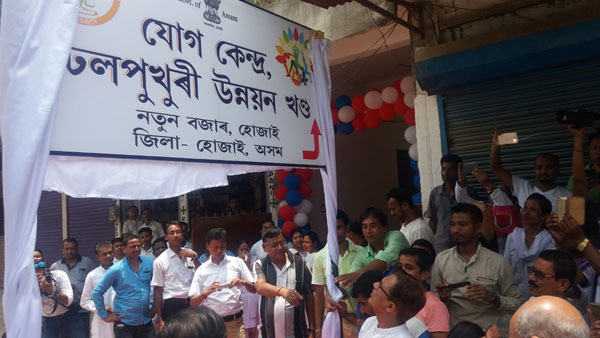 Local Legislator of Hojai Constituency Shiladitya Deb along with Deputy Commissioner of Hojai District Manvendra Pratap Singh formally inaugurated a yoga centre at New Market in Hojaion Sunday. “Yoga is a free hand activity. It doesn’t need any equipment and can be learned without any expense.” Deb added. “We were running the centre from Ram Krishna Mission but now we have opened a permanent premises.” he added. Earlier, K Zaman Choudhury Block Management Committee Chairman briefly explained about the objective of centre and a short session of yoga was also organized where different asaanas and pranayams were demonstrated by the trainer. The Programme was anchored by Professor Pradip Bagchi.